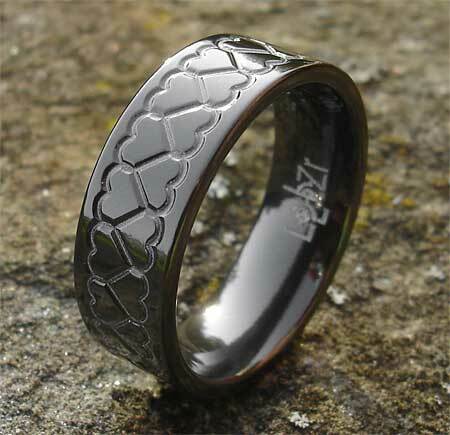 Men's Black Hearts Wedding Ring : LOVE2HAVE in the UK! For something alternative how about this black zirconium wedding ring for men with an interlocking Valentine hearts detail engraving on its outer. This ring makes a great alternative wedding ring or a Gothic ring for a civil ceremony maybe? 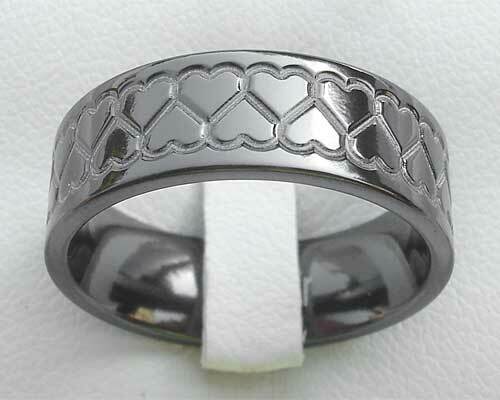 Its width is 7mm, and it is available in a satin or polished finish. We think this ring makes a great Gothic wedding ring and the black zirconium finish looks perfect for your Gothic Valentine too.